The Georgia Gold Rush. Gold Mining History of the U.S. The Georgia Gold Rush was the second major discovery of gold in the U.S. In 1828, placer gold was discovered near the county seat of Dahlonega, Georgia. There are conflicting reports as to who made the first discovery, as several claims are made in various locations throughout north Georgia. Regardless of who found the first piece of gold in the state, by 1829 word was spreading about the rich gold deposits, and soon prospectors from around the country and even the world were traveling to the Georgia in hopes of striking it rich. Despite much of the land being controlled by the Cherokee Indians, the allure of gold attracted thousands of miners. It was estimated that over 10,000 men were exploring the streams of Northern Georgia by 1830. Much of the activity was done near the site of the earliest discoveries in Lumpkin County. The Chestatee, Etowah, and Tesnatee Rivers were producers of much placer gold during the early years of the Georgia Gold Rush, as well as numerous creeks and small tributaries throughout the county. To the east in White County, miners were also finding gold throughout the creeks and rivers. Dukes creek was said to produce many large gold nuggets, and the Chattahoochee and Nacoochee Rivers were also worked extensively by placer miners. Additional mining was done in Union and Cherokee Counties, and other small scale placer operations persisted throughout the northern part of the state across dozens of counties. As the easiest placer deposits began to be worked out after the first few seasons, attention began focusing on the scattered lode gold deposits that were the source of the rich stream gravels. At the peak of the mining boom, there were over 500 gold mines across the northern part of Georgia. In 1837, the Dahlonega Mint was built to handle all of the gold coming out of the state, proof that the goldfields of Georgia had become established as some of the richest in the United States at that time. By 1838, the mint began operation and the first gold coin was struck. An estimated 6 million dollars’ worth of gold coins were struck at the mint until 1861, when it was seized by the Confederates during the Civil War. The denomination of coins produced at the mint included $1.00, $2.50(quarter eagles), $3.00, and $5.00(half eagles). Everything changed with news of the gold discoveries in California in 1849. As reports of the vastness of California’s gold country continued to spread, excitement built among many of the miners in Georgia, and many of them abandoned their mines to search for richer ground out west. Additional gold discoveries were made across the Rocky Mountains, and more and more miners ventured out west each year. Although most of the men left in search of richer ground, Georgia continued to produce gold commercially through the mid-20th century. Although the heyday of gold mining in Georgia is long over, there is still an active group of miners prospecting for gold in a small scale even today. Certainly most of the easy gold has been found, but persistence will still produce some nice gold even today in the state of Georgia. Note that Georgia is often incorrectly credited as being the site of the first gold rush in the United States, but the first gold rush actually occurred nearly thirty years prior in North Carolina at the site of the Reed Gold Mine. 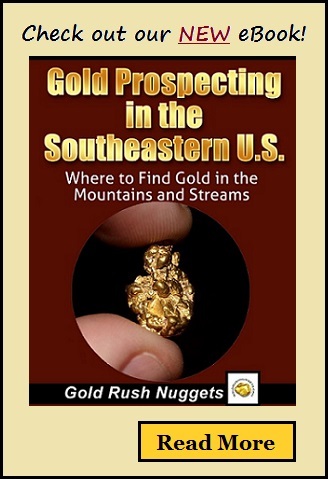 Want to learn more about gold prospecting in Georgia?